Minecraft's original PC version has an incredibly vibrant modding scene, but actually keeping up with all the stuff you need to play them can be a major hassle. 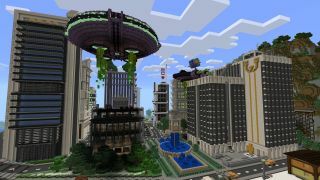 With add-ons coming to Minecraft Windows 10 and Pocket Edition in fall, Microsoft is setting up an easier path for players to tweak the game with strange new creations. For starters, the add-ons update will let you dip into the guts of every Minecraft creature and tweak their behavior. Maybe you think zombies should literally breed like rabbits, or maybe you want to accelerate the chilling grasp of entropy by making creepers super fast. Microsoft is encouraging players to download json (a common filetype for scripting) editors and start tweaking the game, whether on PC or mobile. Staring down lines of code sounds intimidating, but it can be as simple as copying the bit you want - like the lines that make reapers explode - from a donor and dropping it into a new host. Your terrifying creeper hybrids should have looks to match, and you can dip into the texture files with any image editor to change their appearance - like turning an Iron Golem into an imposing alien enforcer. Microsoft may do a formal sharing marketplace in the future, but for now it's content to let user-made tweaks spread on user-made platforms. Fortunately, you won't need to worry about having the most recent version of whatever mod installed to play with your friends: using the Realms multiplayer feature, which lets you rent persistent servers to play with friends, you'll automatically play with whatever tweaks the host has made. And as Microsoft announced yesterday, your multiplayer exploits will now be able to stretch across platforms. These changes are only planned for Minecraft Windows 10 Edition and Pocket Edition right now, but Microsoft's long-term goal is to bring support to all Minecraft platforms including Xbox One. Hey, if Fallout 4 can do it, why not Minecraft? Want more from E3 2016? Take a look at all of GamesRadar+'s E3 features and previews in our E3 2016 roundup.